This cookie combination is one of my favorites! White chocolate doesn't have the health benefits that dark chocolate has but, it was necessary for this recipe! In Fact, white chocolate really isn't chocolate. It contains cocoa butter, a product of the cocoa bean that is also used to produce chocolate. The cocoa butter, which does have a faint chocolate flavor is combined with milk, sugar and often other flavoring ingredients such as vanilla in order to create white chocolate. With that said, white chocolate contains far more sugar and dairy than dark chocolate. The darker you get, the less dairy and sugar content the chocolate will have. Macadamia nuts are one of my favorite nuts for taste and health benefits. Most nuts are typically higher in omega 6 fats, macadamia nuts being one of the lowest. Most of us get too many 6's and that is a pro-inflammatory fat when it is out of balance with omega 3's. Omega 3's are your anti-inflammatory fat that is typically low in the typical diet. Macadamia nuts have had a bad reputation for a long time, mostly because they are high in fat. However, between 78 to 86 percent of the fat is monounsaturated, the good for you, heart-healthy kind of fat. In addition, macadamia nuts are one of the only food sources that contain palmitoleic acid (a type of monounsaturated fatty acid that may speed up fat metabolism, thus reducing the body’s ability to store fat). 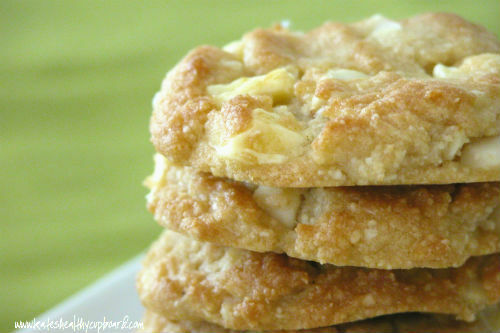 So the white chocolate may be higher in sugar, but at least the nuts in this recipe are one of the best nuts for you! *I used Bob's to see if it would work and it did. I know that Honeyville will absorb a bit more of the shortening and possibly work even better. *This can be made with less sugar using Nature's Hollow Honey made with Xylitol. I did that and it tasted great! Makes about 18 cookies depending on the size. I recently decided to freeze these, so delicious right out of the freezer! Typing this recipe makes me want to make more of these since they disappeared so fast!! !